"Squadron: Ending the Africa Slave Trade consists of well-told, gripping, and graphic stories of individual battles against the East African slavers on land and water." The Royal Navy intercepted slave ships from West Africa starting in 1808 when the United States also banned its importation of African slaves. At that time, the British, French, Portugese, Spanish Empires, and the United States still had slavery in the Americas. Ships of those nations and Brazil, Cuba, and Sweden ran the blockade, however. John Broich writes that this effort "was perhaps the most expensive humanitarian campaign the world has known." The cost was "more than 0.3–1.3% of Great Britain's annual national expenditure." "For many decades the parents of Britain sent their sons to the feverish coast to struggle and die in what most trusted was a righteous effort." Squadron: Ending the Africa Slave Trade goes beyond those forgotten facts to uncover a lost history of one British campaign against the slavers in East Africa that freed some 1,000 slaves in 1868. Would Britain continue "in the blood of the slave fight on the west coast" but "in the face of high costs and in treasure"? Waning public interest added to the excuse of the relatively small size of the East Africa slave trade. Great Britain made huge profits on the region's cloves, copal, cotton, dates, and ivory. Plantations worked by slaves produced products carried by slaves, all financed by local banking capitalized by slave sales. This wealth and treaties with local potentates such as the Sultan of Zanzibar and the Kutchee people of western India also discouraged efforts against the slavers. The Royal Navy had no Sierra Leone to use as a base in East Africa. Local warlords like Hamed bin Mohamed el Marjebi and Matekenya continued "bringing ruin to countries and enslaving their people" using the power of ivory, kidnapping, guns, the French etc. Politically adept, Marjebi even became a sponsor of anti-slavery explorer Dr. David Livingstone. Complaints about the cost, however, ran against "a slavery suppression bureaucracy in London" that outlasted changing politics. Livingstone raised public awareness of the East Africa slave trade, and the British government had directly taken over interdiction from the colonial Indian government. Published accounts of the adventures of commanders Edward Meara, Leopold Heath, George Sullivan, and Philip Colomb eventually led to closing the slave trade in Zanzibar. The men who risked their lives in this venture, black and white, did not always win, however. They acted between matters "that might take place at any of the hundred ports in the Empire or on any of the world's seas." The crews received bounty money for releasing slaves but they had to let the slavers go. By contrast, they hanged pirates. "Stealing property from a ship meant death; yet making property of a human being did not." Africans, some descended from slaves, of the Kru Coast of southwest Liberia also served in this venture. They became renowned for "skill at using a canoe . . . in any kind of sea." Paid as regular sailors, Kroomen "knew the landscape, could withstand the promised physical and mental trials, and understood the challenge." Ending African slavery depended upon Africans. In the wake of the slavers "crops went unplanted or rotted in the fields and livestock starved." Britain facilitated this civil war of Africans fighting to end slavery on their continent. The enslaved suffered starvation, physical abuse, sickness, overcrowding, and murder. Slavers "don't just steal souls and bodies, but hope." Even freed, the victims had no homes to return to and "might struggle desperately to find work at all, even to eat." Being enslaved changed a life negatively, however long that life lasted. "If a country has the military power to stop an obvious evil, should it take action?" Broich asks. That question remains with human trafficking and refugees in the center of many problems today. Broich only touches on the bigger issues although raising important points when he does. 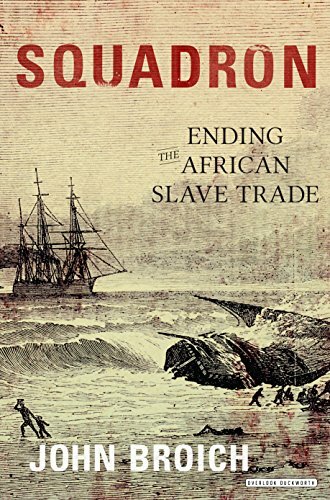 Contrary to the title, this work only covers one brief movement in the history of the slave trade. Squadron: Ending the Africa Slave Trade consists of well-told, gripping, and graphic stories of individual battles against the East African slavers on land and water. The book begins with glossaries of the often confusing mid-19th century Royal Navy ranks and positions. That helps in understanding the positions of the crew on a crowded vessel "a delineated world of regions and districts." The research is annotated.